Michał Sędziwój, otherwise known as Michael Sendivogius, was a Polish alchemist and diplomat who lived a fascinating life in the 16th and 17th century. His groundbreaking alchemical works, which were much valued by the likes of Isaac Newton and Antoine Lavoisier, were milestones on the path to the discovery of oxygen. Michał Sędziwój, the son of a Polish nobleman, was born in 1566 near Nowy Sącz. Not much is known about the earliest years of Sędziwój’s life. Some claim that he was born as an illegitimate son. Some claim that he started his education at a monastic school in Warsaw. It is sure that at a young age he came to Kraków to study at the local Academy. At that time at this institution, just as at many European universities, alchemy was being pursued unofficially. The studies at the Academy most probably prompted Sędziwój to take an interest in that field. It is believed that as a Kraków student Sędziwój encountered Mikołaj Wolski, an influential man, who was himself a practitioner of alchemy. Undoubtedly the two became friends and Wolski began to support Sędziwój’s alchemic research and career. Around 1588 Sędziwój went on a costly voyage across Europe, which was most probably made possible by Wolski, who had ties to the royal court of Rudolph II, the Prague-based ruler of the Holy Roman Empire (a historical European country). There are shreds of information about Sędziwój travelling to the area of today’s Greece and Constantinople on diplomatic missions at that time. He most definitely travelled to the area of today’s Italy, where he encountered local practitioners of alchemy. He also studied at the universities in Leipzig, Vienna and Altdorf bei Nürnberg. Around 1595, after his studies in Altdorf, Sędziwój moved to Prague together with Weronika Stiberin, to whom he was by then married. In this city he conducted numerous alchemical experiments which bewildered many and brought him fame. He was also active as a diplomat as he served as an envoy between Rudolph II and the Polish king Zygmunt III. These services made Sędziwój a rich and respected man. 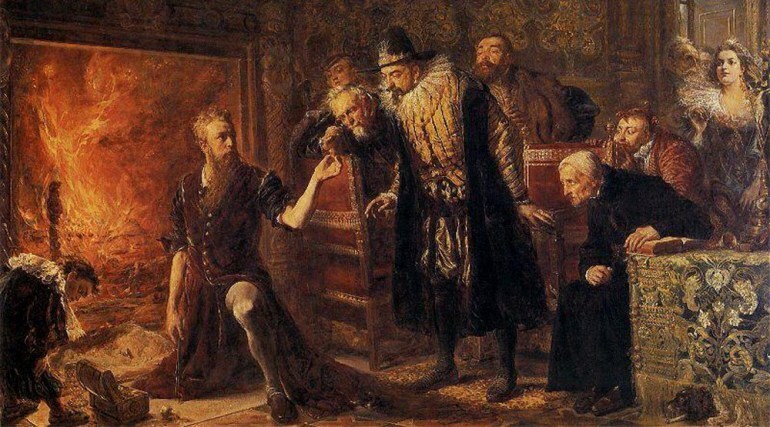 In 1599 Sędziwój suffered a personal tragedy – the death of his wife. A few years later a mysterious episode is said to have taken place in his life. He received news that a friend he met in Altdorf, the alchemist Alexander Seton, who claimed to know the secret of metal transmutation (the changing of base metals into gold or silver), was being held captive in Dresden by Christian II the Elector of Saxony. The elector jailed Seton to force the alchemist to reveal his secret. Sędziwój came to Dresden and managed to orchestrate the escape of Seton, who out of gratitude gave the Pole an ounce of a special powder, the use of which allegedly could turn any metal into gold. There are some historical sources confirming this story. As to the magical powder, it might have simply been a compound enabling gilding. We know for sure that in 1604 in Prague Sędziwój carried out a remarkable experiment using some mysterious powder. He managed to convince Rudolph II, who was a great admirer of alchemy, that in the course of this experiment ordinary metal turned into gold. The ruler was very impressed and had a tablet placed in one of the walls of his castle, which had the following inscription in Latin: "Let another do that which Sendivogius of Poland has done". The same year Sędziwój anonymously published in Latin his famed work De lapide philosophorum tractatus duodecim otherwise known as The New Light of Alchemy. In 1605 Sędziwój came to Stuttgart on invitation from Frederic I, the Duke of Württemberg. The Duke’s alchemist Johann von Mühlenfels, probably together with Frederic I, plotted an intrigue to rob the Pole of his mysterious powder. Sędziwój was imprisoned in a castle tower and was robbed of all his valuable belongings, including a box containing powder. The intrigue was so elaborate that the captors allowed him to escape through a window – keeping Sędziwój captive for a long period was out of the question as he was by then a friend of the Duke’s superior Rudolph II. After escaping Sędziwój informed Rudoph II of these occurrences which resulted in Johann von Mühlenfels being trialed and sentenced to death. Sędziwój however never regained his powder. After these events Sędziwój returned to Poland and settled down in Kraków. In his home country he devoted most of his time to alchemic research. He was given the title of Royal Secretary and most probably had close relations with the Polish King Zygmunt III, who was very much interested in alchemy. Sędziwój allegedly performed a transmutation before the King, this purported event was depicted by the famous Polish painter Jan Matejko in the painting Alchemik Sędziwój / Sędziwój the Alchemist. Thanks to his reputation as a successful alchemist Sędziwój gained funding for his alchemical research. About 1606 he founded a laboratory in a castle in Krzepice. Unfortunately for him, his research didn’t bring the results desired by its funders (producing great riches). Sędziwój’s position in Poland withered and eventually he decided to move yet again. In 1616 Sędziwój left Poland and after visiting Marburg came to Vienna. In Vienna he offered his services to Ferdinand II, the new Emperor of the Holy Roman Empire, who accepted them. By 1620 he was a regular guest of the court of Ferdinand II. For the political doings carried out for the Emperor Sędziwój received an estate in the Duchy of Krnov, which included the settlement of Kravaře. In 1636 Sędziwój died in Kravaře as a wealthy man, leaving his estate to his daughter Maria Weronika. In total Sędziwój wrote 6 alchemical works, mostly in Latin. One of his most popular books was the aforementioned The New Light of Alchemy, which in the period from 17th to the 18th century was published 44 times. His works were translated into many languages including French, German, English and Czech and were printed in a number of cities such as Vienna, Moscow and London. Sędziwój’s most important alchemic conclusion was that air contains a “food of life”, a substance that “gives life to everything”, which is also contained by saltpeter (potassium nitrate). In his works, amongst others in Treatise on Salt which was written around 1598, one can find proof that Sędziwój knew that saltpetre, in certain conditions, releases this “food of life”. This shows that the Pole was the first one to write about the existence of oxygen and also knew how to obtain this element (saltpetre, when heated appropriately, releases oxygen). In his alchemical system this element was called, amongst others, “the food of life” and “the Spirit of the World”. Joseph Priestly and Antoine Lavoisier who are usually alternatively credited with discovering oxygen gas in the 1770s both were acquainted with Sędziwój’s works. Also Isaac Newton, who was a collector and admirer of Sędziwój’s books, was familiar with the Pole's ideas.